Led by four combined touchdowns involving the Eichman brothers, Merrimack easily outpaced Bishop Guertin at home on Friday night, 42-19. The game’s first touchdown involved both brothers, with junior Ben hooking up with senior Joe on a 44-yard completion on Merrimack’s third play from scrimmage. Joe had a 44-yard run for the second TD, and Ben would add a rushing touchdown of his own just before halftime on a quarterback keeper, following a 21-yard scamper by Adam Thornton to give Merrimack a 27-7 lead going into the half. Ben ended all doubt to the contest’s outcome on Bishop Guertin’s next drive, with a 75-yard punt return for a touchdown. Ben was taken out of the contest several times with minor injuries, but was ably replaced by senior Ryan Devanna, who threw for 119 yards on the evening. Freshman quarterback Ryan Dowling also contributed a four-yard rushing touchdown as well on the Tomahawks’ final drive of the night. The Cardinals improved to 3-0, cruising in the first game, 25-14, but then holding off the Tomahawks 28-26, 26-24. The Tomahawks (1-3) were paced by Joanne Bonner (three aces, 32 digs, 17 kills), Emily Johnson (29 digs), Anna Niezrecki (five kills, 24 digs), Meg Brule (three aces) and Alli Marino (13 digs, 26 assists). Brenna Davenport, Jess Trahan and Demetria Gonzalez. The Tomahawks got their second win of the season, while the Cardinals are still looking for their first. 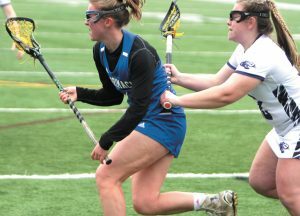 Erin Ortega, Riley Streeper and Allison Sullivan kicked in the goals for Merrimack with Abby Morgan getting two assists and Streeper adding one as well. Merrimack’s Olivia Kapsambelis (two goals, one assist) led her team past Bedford, after two straight losses. Julia Valluzzi (two goals), Molly Beaulier (goal), Brenna Davenport (assist) and Ellie Boucher (assist) all had good games, while Heather Rohr had 10 saves in net to help out the defensive effort for the Tomahawks (2-2). The Tomahawks (1-2) fell in straight sets (19-25, 15-25, 18-25) for their second loss of the season. Isabella Smith led the team in kills with three and also contributed 16 digs on the night. Joanne Bonner (28 digs), Emily Johnson (12 digs) and Meg Brule (11 digs) played well on defense despite the loss.